Choose your baggage with the length of your stay in mind. 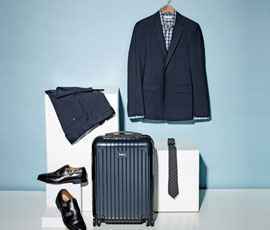 A 22-inch suitcase is best for most business trips. And one with rollers is easier to tote around. If you're going for only one day, bring along a smaller tote bag and a briefcase. A good business bag should be dark, somber, and simple. Avoid unnecessary bright shades. Once right bag is selected, next step is to select things to be packed with the goal of pack light and to pack for business. That means few versatile outfits rather than a different one for every occasion. You’re traveling — expect that you’re going to have to repeat the same jacket a couple of times. One jacket is good for less than two days. If you’re going for more than two, Second jacket probably becomes necessary, along with a few more shirts and pants. Do remember, one of the shirts should be a more of casual style that can be worn without the jackets. If you're only bringing one custom suit, we recommend wearing your suit jacket on the plane to save space. Any wrinkles will vanish when you hang it up in the night. Other way is to fold and pack your bespoke suit’s jackets right way. For this you will find many video’s on internet demonstrating a simple method that will allow your suits to travel in any luggage and arrive in pristine condition. Also choose the fabric that doesn’t wrinkle as much. Meaning wrinkle-free cotton items or lightweight wool; avoid linen in any case. Look for best bespoke tailors in Australia for variety of fabrics. Stick with basic colors like brown or black for dress shoes, avoiding designs and patterns if there is room for only one pair of shoes. If you’ve got room for two pairs, something casual like loafers or topsiders could be picked. Here are few things which should not be forgotten while going for a business trip. Undershirts, underwear’s, socks matching to the trousers and belts are among most necessary stuff. Do carry neck ties or the cravats for sharp look. Cufflinks, tiepins can accompany them too. A Dopp kit is a nice way to keep the toiletries all together. Pack gym wear or sportswear if you'll be golfing, fishing, swimming or engaging in other recreation on your trip. Don't forget the correct footwear for exercise. Make sure you have your travel documents and identification handy.